Listen to John Hollenbeck Large Ensemble on NPR! 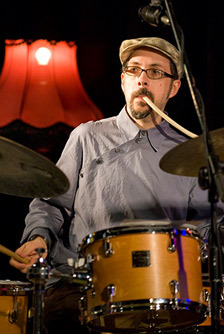 Genre-crossing composer/percussionist John Hollenbeck, renowned in both the jazz and new-music worlds, has gained widespread recognition as the driving force behind the unclassifiable Claudia Quintet and the ambitious John Hollenbeck Large Ensemble, groups with roots in jazz, world music, and contemporary composition. His Large Ensemble’s albums “A Blessing” (Omnitone) and “eternal interlude” (Sunnyside Records) both received Grammy nominations, and in 2007, John was awarded the prestigious Guggenheim Fellowship and in the 2012 he was awarded a Doris Duke Performing Artists Award. He is well known in new-music circles for his longtime collaboration with Meredith Monk, and has been commissioned recently by Bang on a Can All-Stars, Gotham Wind Symphony, Ethos Percussion Group, the Painted Bride Art Center (Philadelphia), the Orchestre National de Jazz funded by the Chamber Music America French-American Jazz Exchange; and the hr-BigBand of Frankfurt, Germany.